Niue is a small island in Oceania located approximately halfway between Tonga and the Cook Islands. 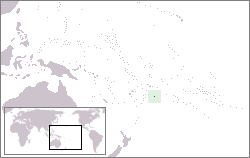 Niue's remoteness, as well as cultural and linguistic differences between its Polynesian inhabitants and those of the rest of the Cook Islands, have led to it being separately administered. The population of the island continues to drop (from a peak of 5,200 in 1966 to about 2,100 in 2002 and about 1,200 in 2011) with substantial emigration to New Zealand and Australia. It is self-governing in free association with New Zealand since 1974, with Niue fully responsible for domestic affairs, and New Zealand asked to retain responsibility for foreign affairs and defence. Niue's timezone is GMT-11; mainland New Zealand is GMT+13 in daylight saving time, so Niue is one day later than the mainland. You need to cross the Dateline (west to east) on travelling from Mainland New Zealand to Niue, so Niue is as much as 23 hours behind the mainland (winter) and 24h (the whole day) behind in the summer time. So be careful about the date when you communicate between Niue and Mainland New Zealand, because Auckland is one day ahead of Niue. All visitors to Niue, irrespective of nationality, are visa exempt for a maximum stay of 30 days. Extension of stay are possible. The only way to arrive in Niue (IATA: IUE) is by plane from Auckland. Be careful not to schedule your flights around religious holidays such as Easter or Christmas, or the October Constitution celebrations, as seats are often at a premium since many Niueans return home at these times. Hanan International Airport is about 2km southeast of Alofi. Taxis meet the flight and many accommodation options include free transfers. If you don't have accommodation booked, just about anyone will give you a lift. Hire a vehicle or bicycle on arrival at one of several rental shops (e.g. Alofi Rentals) There is no public transport system. Getting around the island by car takes approximately 40 minutes. A Niue drivers license is required and can be obtained from the Police department for $22.50 when you present your home license (it's a cool souvenir). There are two petrol stations on Niue; both are in Alofi. One is in Alofi North and the other in Alofi South. Hitchhiking is very easy on Niue; almost everyone will pick you up. Traffic on the eastern half of the island is very light and you could be in for a long wait, so take extra water. Riding in the back of utes is OK, but be careful because palm leaves can get your eye poked out if you're not careful. 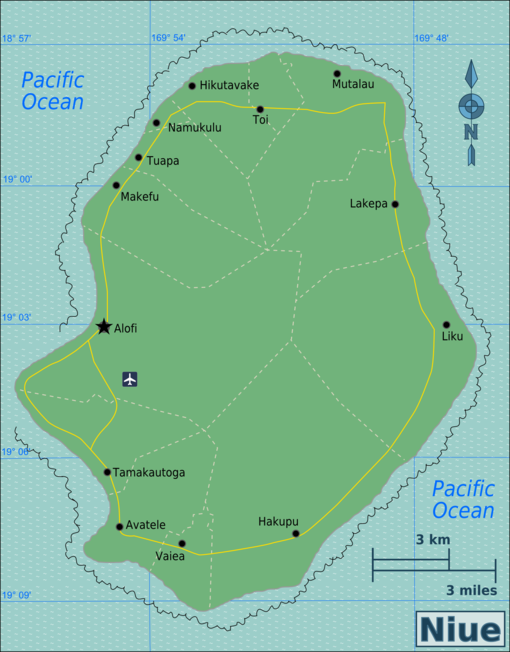 Alofi and all the other villages are small enough to walk around. Cycling around the island takes around three hours. There's no harm in walking around the villages and in town as it is perfectly safe and a good way to catch and interact with the Niuean culture itself. English (often with a distinctive New Zealand accent) is widely spoken. The local Niuean language is increasingly falling out of favour but you'll win the hearts of many locals by learning a few Niuean words. If you're wanting to play a bit of touch, what better way to do it, by playing the locals. About every village has a green and most evenings the residents come out and play a friendly game of touch. So if you feel like mingling and playing a bit of sports, just ask around and you will find a game. Niue uses the New Zealand dollar ($) as its national currency. After 9 years of trading, Niue’s previous sole provider of commercial banking services, Papua New Guinea’s Bank South Pacific, closed on 30 Apr 2013. A New Zealand bank, Kiwibank, opened for business the next day and offers a greater range of services - including internet banking - and consequently there are no overseas transaction fees for New Zealand EFTPOS cards. Kiwibank in Alofi opens M-Th 09:00-15:00, F 08.30-15:00. There are no ATMs, though almost 30 businesses now accept EFTPOS and most of these also accept Visa and MasterCard credit cards. It is still recommended that people show up in Niue with cash. Even though some places now accept credit cards the system is often down. If you run out of money you will be stuck. Take the hint, do not show up in Niue without more money than you'll think you'll need! Few souvenirs are available. Postcards are available at the post office and there are two souvenir shops in Alofi. There is also an art gallery at the Niue Commercial Centre. Niuean weaving is among the finest in the Pacific and makes great souvenirs. Don't expect McDonald's, Burger King, Subway, and KFC...unless you want to fly to New Zealand or Australia to get your fix. Bring a sense of culinary adventure. Local specialities include uga (coconut crab), anything with coconut, and the like. If you love tropical fruit you'll have fun in Niue; passionfruit, cassava, taro, vanilla, kumara, and various other fruits are available but it can be a bit hard finding where to buy them - try the Tuesday or Friday morning market in Alofi, or various roadside stalls. The supermarket has a limited selection. Frosty Boy serves great vanilla bean shakes and ice cream. Most places to stay are in or near Alofi, and there are one or two options going toward Avatele. Accommodation is nonexistent on the eastern side of the island unless you have friends or are fortunate enough for a local to invite you in. Camping is not permitted on the island. There is one small campus, a branch of the Fiji based University of the South Pacific and only one high school and one primary school. However, you can learn a lot about the history and culture of Niue just by speaking with older people who are in the know. Opportunities to work on Niue are extremely limited. Teaching positions may be available at some of the primary schools, and success in business is also a possibility. Niue is a very safe island. The only jail is located next to the only golf course and is considered an open prison. Crime is extremely minimal if not non-existent, and it's not uncommon for tourists to meet the Premier. If you want to meet your first world leader, this is the place! Niue Foou Hospital is a basic hospital is located near the airport. Medical evacuations can be arranged to New Zealand if needed, but use common sense and take out travel insurance. There are no snakes or poisonous insects. There is no malaria but the mosquitoes are awful during the wet season (December-March). Dengue fever does exist on Niue, and the High School's art teacher passed away from it. Take proper precautions. Sunday is a special day reserved for Niue's strong church-going population. Fishing, kayaking and diving is prohibited by law on Sunday. Swimming is also prohibited on Sunday but, in practice, you can swim at many locations away from villages without any offence to the locals. Two options for internet is available, one is RockET wifi spots around the island, but internet works like Edge in mobile, very very slow, good only for IM. Cost NZ25.00 for one month voucher, you get user and password. Second option is internet from Niue Telecom, you can buy voucher in Telecom office. NZ$5.00 for 1hour and NZ$15.00 for 24hours(no data limit). Internet is fine and good for video calls, downloading and youtube too. Telecom Office is open 24 hours and there is a table and chairs available for sitting and notebooks. Some accommodation options offer internet access, but they use RockET and internet just works for IM. There is now a limited mobile phone service on the island, which only works in the capital city of Alofi and 5-10km from it. You can buy a SIM card from the Telecom Office for $34 (plus $5 credit) or in airport on arrival. Using sim card you can make international calls and send local sms messages, no internet available. This page was last edited on 14 June 2018, at 11:29.